Miranda And Dierks Are Locked And Reloaded! 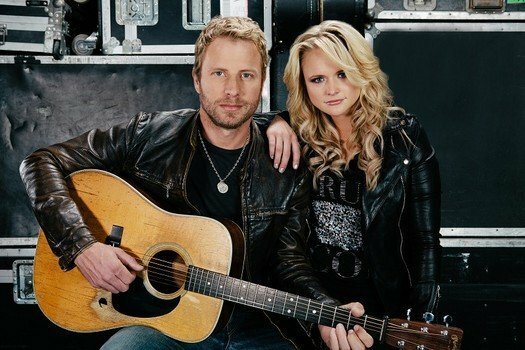 Known for their distinctive styles of music, Miranda and Dierks Bentley announce their 2013 Locked & Reloaded Tour. Set to kick-off January 17, Miranda and Dierks bring to the stage scores of # 1 singles, chart topping albums and trophies from The Grammy’s, CMA’s ACM’s and CMT’s. “Making music for our fans is the best job in the world,” says Miranda. “It’s especially great being able to take to that music on the road with someone I respect as an artist and human being. This will be a tour of ‘epic badassery,’” she laughed. The Grammy Award winning singer-songwriter is the reigning two-time CMA and reigning three-time ACM Female Vocalist of the Year. Her current album, Four The Record, made history when it debuted atop Billboard’s Top Country Albums chart, making Miranda the first country artist in the 47-year history of the chart to have each of her first four albums debut at # 1. Four The Record won the ACM Album of the Year Award and garnered rave reviews. Her headlining ‘On Fire’ Tour played to more than one million fans this year. Miranda dedicates much of her time to her MuttNation Foundation which has raised more than $700,000 to fund no-kill animal shelters, pet adoption, spay and neutering of pets and much more. Multi-platinum selling singer/songwriter, Dierks Bentley has forged his own brand of country music combining classic country songwriting, influences of bluegrass instrumentation and the energy of rock‘n’roll. Bentley’s sixth studio album HOME, released earlier this year, debuted at No. one and has spawned three chart-toppings hits, marking 10 career No. one songs as a singer and songwriter. HOME is also currently nominated for three 2012 CMA award nominations for “Album of the Year” and “Single” and “Song of the Year” for its title track. His five previous studio albums have sold more than five million copies and earned him an invitation to join the Grand Ole Opry.